This is our 3rd and last review for Sweet Heat Gourmet. They have done pretty well for themselves thus for in the 1st two reviews. They received 4 flaming hearts from 5 out of the 6 reviews, and the other one received 3 1/2 flaming hearts. Not too bad of a start. Now this here hot sauce is using what many consider to be the uncrowned hottest pepper in the world, the Moruga Scorpion, measuring over a whopping 2 million scoville units. The ghost pepper that was once the champ was only a little over 1 million. How will our brave team of reviewers handle this hot sauce? Well I will tell you this about the hot sauce, it is tomato-based and seems to be created with flavor in mind and not solely about destroying anyone. I like to think that if more hot sauce companies kept that in mind, then there would be a lot more tasty Moruga Scorpion products out there than there are. Our review team consists of Dale Gilbert, Don Lava, and Revtommy2tone and he is back with his co-pilot Rick Averyt. 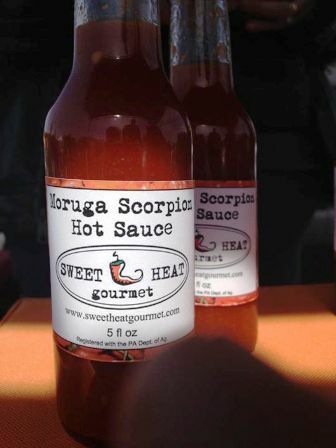 I would like to thank Sweet Heat Gourmet for allowing us to put the spotlight on their company. Please check them out at the website below or come by their Bowers Chile Festival booth next month and say hi, because they will be there sampling and selling their wares.